Be the One Others Turn to for Answers. 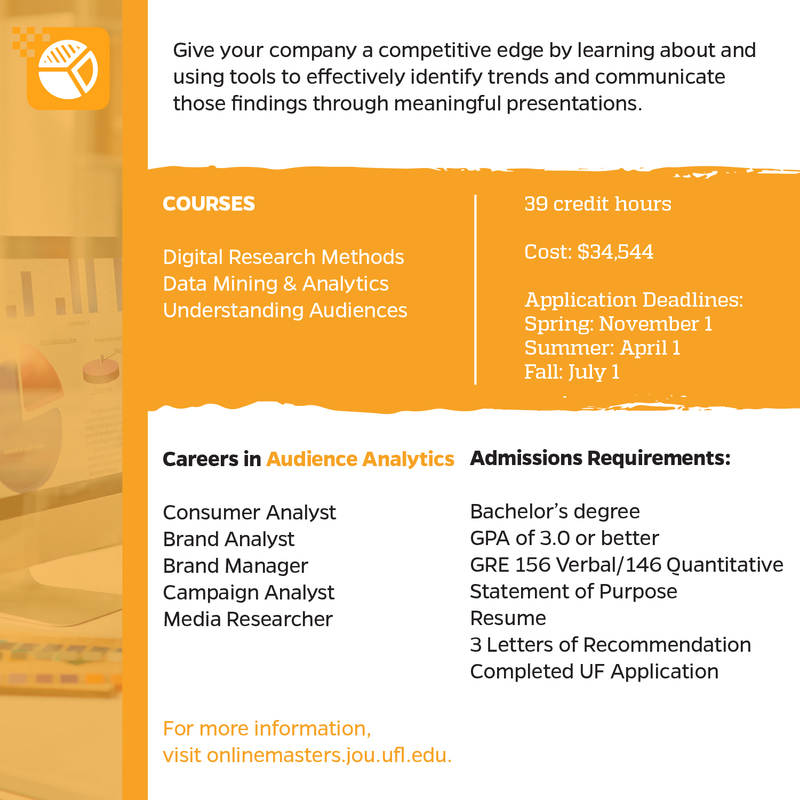 The University of Florida online master’s specialization in Audience Analytics is a first of its kind degree to prepare experts to understand today’s audiences and consumers, their preferences, and behavior. By skillfully analyzing and interpreting data with the tools, methods, and conceptual foundations featured in this program, graduates of this program will be masters of audience analytics who will not only be able to interpret the data and find the stories, but be effective data storytellers. Audience and consumer analysts are the “brain trust” of an organization. You are the one who knows who’s consuming what media content and when, who’s purchasing what products, under what conditions and time of day. You are the one who detects trends and patterns in data that have so far gone undiscovered. You are the one who uncovers actionable insights, converting them into business intelligence and marketing opportunities for your company. And you are the one who effectively communicates these data insights to stakeholders. As an audience analyst, you will be the one others turn to, because you have the answers. Why does this matter to companies today? Because businesses don’t buy media. They buy audiences. Consumer Behavior How people select and use products, services, experiences to satisfy their needs. Data Analysis Identify trends and patterns; translate data into stories to help companies make better decisions. Media and Audience Research Carry out quantitative and qualitative research; apply media research and audience analysis to address company goals. Prepare students with the theoretical foundations, industry knowledge, and analytical tools to understand the nature, value, and behaviors of audiences across multiple media platforms and disciplines. Equip students with the analytical tools and methodological foundations to assess and analyze audience-related datasets, and to understand how to use such data in order to make informed decisions. Familiarize students with the analytical tools available for understanding and segmenting audiences and consumers in traditional and digital media. Cultivate a global and diverse perspective and appreciation of audiences everywhere and to prepare students to understand and serve diverse audiences. Help students become wise users and consumers of data, to develop data literacy, and provide an ethical grounding in the analytics practice. My online degree from UF has had an incalculable impact on my career. I consistently use the abilities we were taught, and the small class sizes allowed me to learn a great deal more than I expected. The professors and staff made me feel welcome, and created an environment to challenge us. At no point in the experience did I feel I missed an actual classroom.